Last week, Michael Ericson Head Coach of the Darebin Falcons VFLW team announced this year’s Captain, Vice-Captain and leadership group. Stephanie Simpson, 7-time Premiership winner and Falcons veteran has been named as skipper, with Annalyse Lister as Vice-Captain. Gena Lawson-Tavan, Molly Eastman, and Kathleen Roe round out the leadership group. 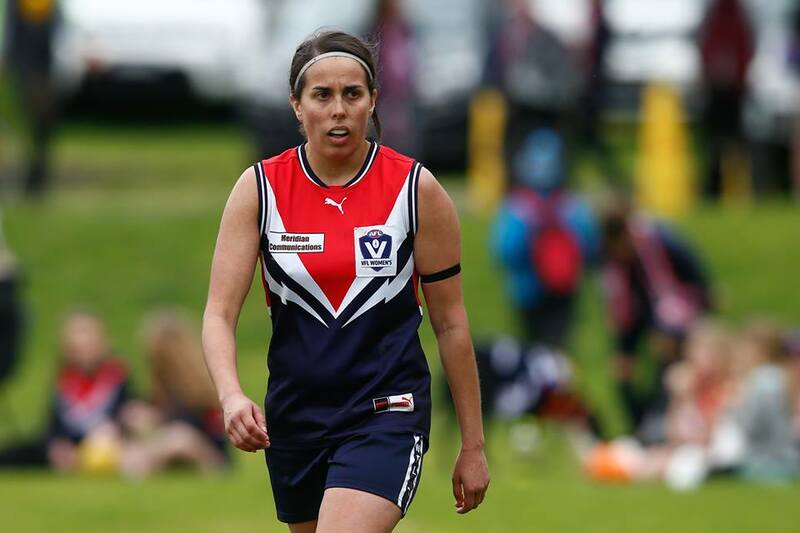 Stephanie Simpson has been a member of the Darebin Falcons senior AFL team since 2009, has played over 120 senior games as a Falcon, plus 60 games as a Junior at the Warrandyte Football Club. Steph has also represented the Western Bulldogs in the 2014 exhibition game and selected to be part of the Victorian State team in 2013. Being part of the club for over ten years, Steph has been an integral part of the amazing Darebin culture, and wants to make sure this culture stays strong with our new teams and players. Steph comments “One of the things that has set us apart is our strong culture and I believe that it is up to the club’s senior players to keep this alive and lead the way on and off the field. This is really important to me as I want to give back to the club that has provided me with so many opportunities and helped me grow as a person in so many ways”. Michael Ericson, Head Coach adds “Steph has really shown great leadership since the first day I met her. She consistently gives so much to the club, both on and off the field. As a player, she really leads by example and I’m excited to see how she goes this year as captain”. Michael also believes that the Leadership group for 2019 has the perfect mix of experience, saying “This year’s VFLW playing group voted in the entire Leadership Group. We have ended up with a fantastic mix of youth and experience. Each bring some unique traits that will build a strong leadership group. I think they will drive the strong Darebin brand as a whole, and it’s great to see the full investment by all in the club and program”. We are so thrilled to have such amazing talent representing our VFLW team. Our Vice-Captain Annalyse Lister has played in the midfield with the Falcons VFLW team for two years and has an impressive sporting background. Annalyse represented the Vic Vipers and the SA Suns in the Australian Hockey League and continues to play hockey in the Victorian Premier League. Kathleen Roe has been a Falcon for thirteen years, and brings a wealth of experience to the leadership team. Having won multiple premierships, Kathleen knows what it takes to make a successful team. Kathleen also brings a broad sporting background having played both cricket and soccer for many years. Molly Eastman has been with the Falcons for two years after playing football at the Calder Cannons and the Fitzroy Junior Football Club. Molly has brought an amazing energy and talent to the Falcons VFLW midfield and was recently selected by the West Coast Eagles to train with their squad as they prepare to enter the AFLW in 2020. Gena Lawson-Tavan rounds out our leadership group, having played with the club for seven years and is a great example of one of our girls following the Darebin Falcons AFL pathway, from Juniors to VFLW! Gena is a fierce tall defender with incredible skills. She’s played in 5 premierships and was nominated for the VFLW Rising Star Award in 2017. Collectively our leadership has over 30 years’ experience as Falcons footballers! We know they will lead our VFLW team with knowledge, skill and passion. Go Falcs!